More beautiful every day! Thanks for visiting me on a not so pleasant blog-topic-day. When I come here, the winds of anger have subsided and I can sit back and enjoy civilized discorse. p.s. you have just the right blend of poetry in verse and in images. Your blog is always so uplifting. Thank you!! the foreground and middle look like pointilism! Seurat like in texture...LOVELY!!! Beautiful photos! I am heading to Italy in a bit more than a week. What beautiful pictures! 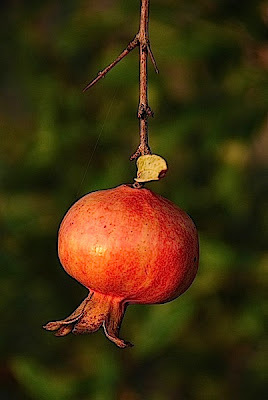 It is years since I have eaten a pomegranate, and that one looks so ripe and delicious! I had quite forgotten pomegranates while in NY. Hello Merisi, and many thanks for your message. Well, I do know that you can show us the beauty to be found throughout Vienna, and make us viewers long to follow your footsteps to each lovely square, garden, and ... Cafe. Now, as autumn begins, you are making me long to travel to Italia. The change in the light is remarkable, the poetry of your eye is consistent. I found my way here from lakeviewer's. What in intriguing blog -- a thoughtful mixture of pictures and words. Well worth a visit. Besides, I love fall and I love rainy days. So beautiful, Merisi - thank you! Now, where do I want to go on my next holiday - Italy or back to Austria? You make everywhere look so wonderful! I hope you travelled there by train... would have been a beautiful journey! 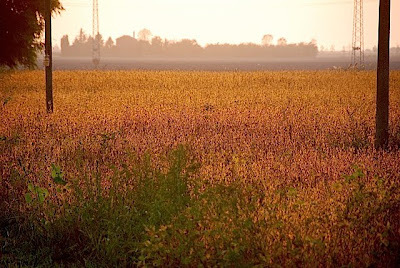 It looked like a field of gold! To which part of Italy are you going to be travelling? I took these images when our side of the world fell into autumn! I love autumn, especially these days when the sun's still strong. Those pomegranates at the top of the tree could well have had a view of Marokko beyond the sea! enjoying a truly beautiful and warm Indian Summer. Travelling along the Venetian Lagoon and the Veneto region's small seaside towns this time of the year is a real feast for the eye and the soul - I travelled by car, though. I have taken the train down from Vienna to Venice at other times, it is a beautiful journey, indeed. Love your italian days post !!! Hope to see soon your provencal days !! !